The issue isn't immigration — it's male entitlement. I have been an avid runner since 2015. My home neighborhood in Denver provides an ideal location for scenic jogs. There's a trail nearby that runs along a creek, shielded by a canopy of aspens and evergreens. My university in Louisiana has a path around its lakes that is frequented by runners, bikers, and their dogs, and when the sun rises over the water it's absolutely divine to witness. I tell my mother I am going for a run. She requests that I take someone with me. She begs me to get home before dark. She insists that I notify her when I've made it back safely. I reassure her that I'll be fine. Still, as I set out for my run, I can't shake the feeling that I'm leaving home with a target on my back. By now, most have heard the tragic story of Mollie Tibbetts, a girl who was murdered while on a jog in rural Iowa. Unfortunately, Mollie was not the first woman to deny a man her attention and pay the price with her life. Tales such as these have garnered national attention since 1997 when 12-year-old Laura Smither was killed on a morning run in Texas by serial killer William Reece. Mollie's murder is just one among many examples of violence against women. 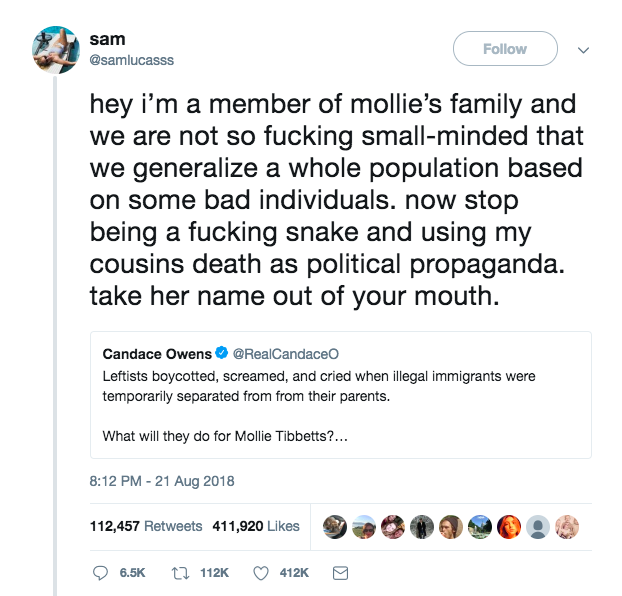 The difference in Mollie's case, however, is that her killer happened to be an illegal immigrant. Lots of people have been quick to point out the fact that Mollie Tibbett's killer was an undocumented immigrant, including this article, "Wake Up America! Mollie Tibbetts Would Still Be Alive Today If We Stricter Immigration Policies," which suggests that such an event never would have taken place had we implemented "stricter immigration policies." However, Mollie's murder was not an isolated incident. This isn't the first time a woman has been murdered by a friend, partner, or stranger, and the common denominator isn't illegal immigrants — it's men who can't take no for an answer. Most women are all too familiar with being harassed, followed, or even threatened by men. For many of us, it's incorporated into our daily routines. A 2017 survey reports that 43% of women have experienced harassment while running (the number rises to 58% for women under the age of 30). 1 in 3 women have experienced physical or sexual violence at the hands of men. It's impossible to tell how many acts of violence against women are committed by people who are here illegally, but besides the fact that undocumented immigrants are less likely to be perpetrators of violent crime, scapegoating immigration is missing the point entirely. Mollie's father also voiced his thoughts as a guest columnist on the Des Moines Register, expressing his disdain that people would dare to use his daughter's death as a catalyst to a racist, xenophobic agenda. Blaming the incident on illegal immigration as a whole isn't just shifting the blame — it's disrespectful to Mollie's memory. While examining what lead up to Mollie's murder and violence against countless women like her, the question remains: what can we do to fix it? The World Health Organization identifies risk factors associated with becoming a perpetrator of physical and sexual violence, including but not limited to poor education, exposure to violence in the home, social norms that recognize men as inherently superior to women, mental illness that goes untreated, and sexual entitlement. There's no clear answer to the question of how to end violence against women, but perhaps we can start with strengthening our education system, improving our healthcare, and socializing our children into environments that embrace gender equality early on. But one thing is for sure- vilifying immigrants and creating further division is not the solution.